Sab Shimono. Photo courtesy of Sab Shimono. 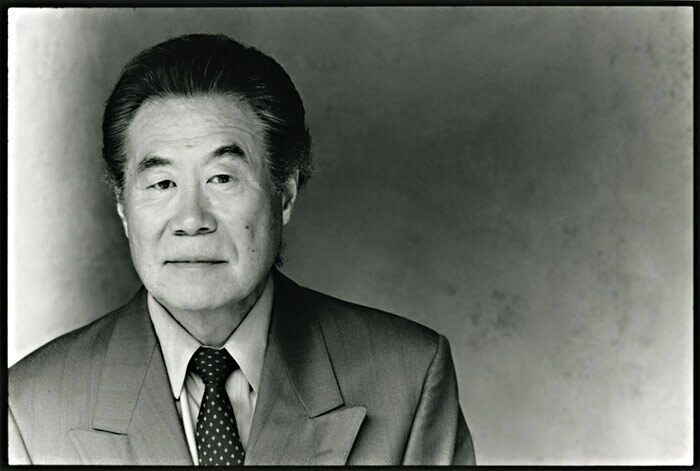 For more than five decades, Japanese American actor Sab Shimono (b. 1937) has performed on stage and screen in over 150 roles and counting. In 1966 Shimono first appeared on Broadway in Mame (with Angela Landsbury), and he was part of the original and revival casts of Stephen Sondheim’s Pacific Overtures as well as numerous theatrical productions written and directed by Philip Kan Gotanda such as Fish Head Soup, Yankee Dawg You Die and The Wash. His feature film credits include Gung Ho, Come See the Paradise, Presumed Innocent, Suture, Waterworld and Robot Stories. Shimono makes regular television voice and screen appearances on Jackie Chan Adventures, Teenage Mutant Ninja Turtles, The Simpsons, Hawaii Five-0 and Mad Men and remains active in Asian American film and theater. In March 2016, Shimono and his partner Steve Alden Nelson sat down with Tina Takemoto for a private interview at the Berkeley Repertory Theatre. This interview inspired Takemoto to direct Semiotics of Sab, a short film playing at queer, experimental, and Asian American film festivals including San Diego Asian Film Festival, MIX NYC, and CAAMfest. Sab Shimono in Mame, 1966. Photo courtesy of the Smithsonian’s National Museum of American History Archive. Tina Takemoto: What are your early memories of growing up in Sacramento and going to the Japanese American incarceration camps? Sab Shimono: My father was born in Japan, and my mother was born here. I was born in Sacramento, so I am nisei-han (second and a half generation) or sansei (third generation). First, my family went to Tule Lake in California, and later we joined my mother’s family at Amache camp in Colorado. After the war, my uncle and relatives returned to their chicken ranch in Cotati, and my family moved back to Sacramento and their restaurant business. Somehow our Chinese American friend Charlie, who was a butcher, was able to keep paying rent for our tiny apartment. It was not the best apartment but at least it was a place to come back to. TT: What happened to your restaurant while you were in camp? SS: We entrusted it to a man who sold our business for something like $3,000. Before we left, our friend Charlie said, “Do not trust this man.” When we returned to Sacramento, we had to start all over again. But my mother carried cash near her breasts when we went into camp, so there was some money to start another business. TT: What was the name of the restaurant and what kind of restaurant was it? Did you work there as a kid? SS: The first one was called Bay Café. The second one was Diamond Café on K Street between 1st and 2nd Street. It was a mom and pop restaurant serving American food — hamburger, beef stew, corned beef — in a working-class area downtown. I worked there, but I was not a happy camper. It was child labor, you know, peeling hot potatoes before and after school. Later, I became a waiter. TT: What were your memories of camp? I understand you were quite young when you went in. SS: I think I was turning seven when we left camp. We never heard about what the family went through. I can only remember moments. Before we went to camp, I remember my father and mother were on the bed tearing up documents. They were perspiring even though it was very cold. They were throwing things away and deciding what to keep. But we never really talked about it. TT: How did your older siblings respond to camp? I understand that some kids felt more independent from their parents. SS: In some ways, camp was good for my older brother and sisters because they didn’t have to work. They could get an education and play baseball and didn’t have to eat meals together. My older brother sort of separated from the family and found his own circles. I didn’t realize it until much later, but the family ties were broken in camp. TT: You and your twin brother were so much younger. Did you stay closer to your parents in camp? SS: Oh yes. We were so small and young during the camp experience. It’s like in the play Aubergine when they talk about the difference between being born blind and becoming blind later in life. The person who is blind from the beginning has no regrets or point of reference, but the one who had sight suffers more. I consider myself like the one born blind, but I imagine that people old enough to really understand the situation were hit harder. If I put myself in their situation, I would have been so angry. In some ways, it was good that my parents didn’t discuss it or give us a negative view of racism. They just focused on their business and shikata ga nai or “just keep on going.” Also, I wasn’t near home during the Redress movement. I was living in New York away from the discussions that were happening on the West Coast. But I have done a lot of plays about internment. That’s where I got my understanding of what happened. TT: What was your experience of working as an actor on Come See the Paradise as one of the first large-budget Hollywood films about the wartime incarceration camps? SS: Come See the Paradise opened in December 1990 for the Academy Award season. Then Desert Storm started in January, so the studio pulled the movie out of circulation because it was wartime, and the studios only wanted to show pro-American films. The director Alan Parker said, “I should have released it during the Redress time in the late 1980s. The timing would have been better.” Instead, this important studio film that we thought would be seen by many had to be pulled because of the storyline. TT: How did it feel to be on the set of a reconstructed camp? Did it bring back memories? Did it provide more insight into your family’s experience? SS: They built the barracks for the set, and the feel of the film was pretty authentic. One memory hit me during the filming. Before my family left camp, my twin brother and I made a chair out of mud. We thought it was something that we would come back to later. In the film, I played a grandfather who is making a wooden chair for his granddaughter. I thought it was so ironic that I was making another chair in camp. There is something about the fact that it was a chair. TT: You played the role of Hiroshi Kawamura, a first-generation issei man who joins his family in camp presumably after being held at a Department of Justice prison. Some of the Japanese American inmates ridicule him because they assume he is guilty or disloyal. How did you understand this issei character and his journey? SS: I understood the character through my father, who was also sent somewhere and separated from us for a while. Many leaders of the Japanese American community were sent somewhere else. They suffered a lot of shame and humiliation, but they didn’t do anything wrong. Many of them didn’t even know why they were separated. TT: In the film, your character becomes increasingly depressed. We see him in sick bay giving the son-in-law (played by Dennis Quaid) his blessing about being with his daughter (played by Tamlyn Tomita). Later in the film, the elderly man gets out of bed in his nightclothes and starts walking toward a guard tower. The next scene shows the family standing around his modest grave. How did you understand your character’s death? SS: The way I look at it is that something happened to him when he was away from the family. He was totally destroyed. I assumed he was broken by interrogation or whatever he went through, and his spirit was devastated. TT: How do you think he actually died? Did he keep walking and die of a heart attack? Did he get shot while walking toward the guard tower? SS: No. No. I took it that he went under the fence and just kept on walking because he was totally dazed. In fact, I remember shooting that scene. I am walking toward the sunset and the camera is behind me. I keep walk walk walking, and I get to the fence. No one says, “Cut.” So I just stand there. I’m thinking, “They didn’t tell me to go under the fence, so what should I do?” So, I turn around very slowly. Then I see the whole crew running the opposite way to get another shot before the sun goes down. But they didn’t tell me to stop; they didn’t say, “Okay Mr. Shimono, that’s good, that’s enough.” So I was still acting. [Laughs] But, I do think the character did go under the fence and just walked until he collapsed. In that climate you can get dehydrated fast. Plus, he was ill and heartbroken. That alone could kill you. TT: Did your family watch Come See the Paradise? SS: My father had already passed away, but my mother saw it. When my family talks about my work, they say things like, “That haircut. You should have combed your hair differently.” [Laughs] They never tell you that you were good. Instead they say, “Your hair could have been different.” But I’m sure they were proud. They were proud that their story was told and they saw it. TT: How did your family respond when you told them that you wanted to be an actor? SS: They didn’t know what hit them. I was at Cal (University of California, Berkeley) when I told them that I was going to New York to study acting, and I was gone within two weeks. My twin brother was already in New York studying fashion. But my family was very supportive and gave me enough money to survive so that I could study with Stella Adler in the same cohort as Robert De Niro. I also worked as an NBC page. TT: Asian American visibility in film and on stage is still rare. Even during the 2016 Academy Awards, which was criticized for having an all-white roster of acting nominees, the host Chris Rock made two tasteless jokes at the expense of Asians and Asian Americans. The USC Annenberg School for Communication reports that in Hollywood film only 1 in 20 speaking roles goes to an Asian American, and only 1.3% of lead roles go to Asian Americans. Your career has been incredible especially in light of these statistics. SS: Yes, it is a rarity. TT: You have also done a lot of activism for Asian American actors. In 1972, you were part of a human rights complaint against the Repertory Theater of Lincoln Center for its discriminatory hiring practices that excluded Asian American actors. In the mid-1980s, while you had a prominent role in the movie and TV series Gung Ho, you gave a number of speeches to businesspeople and the community about the importance of supporting Asian American actors. In this regard, I want to ask you about your role in the 1993 film Suture. The film is about two identical twin brothers who are reunited as adults. The “trick” of the film is that one brother is played by a white actor and one is played by a black actor. But no one within the film acknowledges their racial difference. You play the role of the narrator and a psychiatrist who is trying to help the black character recover from amnesia. Was the part originally written for an Asian American, and how did you get the part? SS: I didn’t audition for the role. The way I got the part was that I met the two directors and they said, “We like your voice.” And that was it. TT: Your character provides the powerful opening and closing voice-over for the film. I was struck by the fact that it is one of the few Hollywood film roles in which you do not have to perform with an Asian accent. Do you think that your Asian Americanness was part of the directors’ intention? SS: I think that they were exploring race without saying so. Apparently, Michael Harris and Dina Merrill were chosen as the white characters because of their look and their aquiline noses. Dennis Haysbert was chosen to play the African American role. I was chosen because of my voice and maybe because of my race. That’s what fascinated me. All of this stuff about race was going on, but nothing was really discussed. TT: What are the specific challenges facing LGBT Asian American actors on stage and in film today? SS: I don’t think actors go around saying they are gay. It is not discussed. You go in for the role, and if you are the actor they want, you get the part. For Asians in film, it’s not like there are many romantic lead parts for us. I have played romantic leads in theater, but in Hollywood film, if you were gay, it would have been a problem. When I think about Rock Hudson, if he would have been out, he probably wouldn’t have gotten the roles he did. I’m not sure how much of that is true now. I think it is still there, because the audience wouldn’t “buy” it. They would believe a straight guy playing a gay man, but I don’t know about the reverse. SN: But it’s not that you have tried to keep it a secret, at least as long as I have known you. SS: No. I have lived my life the way I have wanted to live my life. I haven’t hidden anything or changed my behavior because of who I am. But I don’t flaunt it. In film and television, I very rarely play the romantic lead. I did play the husband in Hot Summer Winds, and I have played some other romantic roles. But I don’t know whether the directors knew I was gay or not. In theater it might be different. But in film, I never know if they know about my personal life. Sab Shimono (left) with husband Steve Alden Nelson (right). Photo courtesy of Tina Takemoto. TT: What are your thoughts about the experiences of gays and lesbians in the concentration camps? Have you heard any stories or do you have any thoughts about what life would have been like for them? Do you think the Japanese American community would be resistant to thinking about this history? SN: I think if Japanese Americans were not willing to speak about the camp experience, they certainly wouldn’t open up about their sexuality. Their stories would be locked away twice. SS: Although now people are willing to talk about their camp experience if they are asked about it. They don’t monku or complain about it, but they will talk about it. I think if you did research on the bachelor’s quarters and figured out who was living there, you might find some information. I have not heard any gay stories about camp. But I have wondered, if you were gay and you were in camp, where would you go? The barracks have thin walls, so where did they go? TT: In one case, there were two men who got a citation for being drunk, but in the record it looks like they were having a roll in the tumbleweeds. SS: Oh, yes. I suppose after security lessened and the guards weren’t there as much, you could slip out into the dunes. And the bachelor’s quarters were something else too. Hmm, I’m sorry I don’t know more. I wish I could have had some good memories, some more interesting memories. [Laughs] This conversation makes me think about the Olympic weightlifting champion Tommy Kono from Sacramento. He won two gold medals in the 1950s and broke many world records. But when he came back to Sacramento, the city didn’t give him a parade, which they would usually do for a hometown boy. Around the same time, a woman won the national golf championship and she got a parade. TT: Do you think Kono didn’t get a parade because he was gay? SS: I don’t know. I’m just curious. There might be a connection. I’m told that his performance as an Olympian was the best ever. Tommy Kono moved to Hawaii. TT: What are your memories of The Other Side, the popular gay piano bar in Silver Lake in Los Angeles that closed in 2012 after 40 years in business? SS: It was great. It was a neighborhood bar. The same old gang was always there. I would have two drinks and go home. The Other Side and New York Company were the last of the nice gay bars. But we don’t have them anymore. Many of the bars disappeared because of AIDS. The people who were owners and customers, they all disappeared. MJ’s is gone, Cobalt is gone. We don’t have our neighborhood bars. SN: Sab and I reunited at The Other Side after many years. Can I tell that story? SN: Sab and I met at Cobalt Cantina a long time ago when we were both in other relationships. From the moment I laid eyes on him, I immediately fell in love with him. I had never seen his work. I didn’t know he was a famous actor. I just thought, “My God, he looks like a movie star.” It was the late ’80s or maybe early ’90s. I was introduced to him though our mutual friend. I said to Sab, “If we weren’t with other people right now you would be going home with me.” And he said, “Okaaay.” So we kind of stayed in touch for a while, and then we completely lost touch. I ran into him once briefly at Sundance when we both had films there. And I thought, “Oh my God, there he goes again.” Then I moved to New York with my partner, and we split up after four years. I had a friend in Connecticut who had just bought a new car and asked, “Would you ever trade your apartment for my car for a couple months?” So I hopscotched across the country in this brand new car while he lived in my apartment. I arrive in Los Angeles in the winter of 2001. I walked into The Other Side and there was Sab at the bar. I thought, “Oh my God.” I asked him, “How are you doing?” He said, “Good, good.” I asked, “How is your partner?” He said, “We split up.” Then I said, “I’m single too. Do you want to go to dinner?” And we have been together ever since. TT: I also have a story about The Other Side. Years ago when I was recently out to my parents, my friends and I took them to dinner at The Flying Leap. Our table wasn’t ready, so we went to The Other Side for a drink. My mom was very enthusiastic about my being out, but my dad had been pretty quiet about the issue. I wasn’t even sure if they knew we were at a gay bar until my dad said, “I recognize that man sitting at the bar. I went to school with him at Cal. I think he is a famous movie star.” And he discreetly pointed to Sab sitting at the bar. So my father’s first acknowledgement of me as gay was through our conversation about seeing you at the bar. TT: You recently deposited your personal collection in the Smithsonian Archives. How did this come about and what are your hopes for how your collection might be used in the future? SS: The Smithsonian came to me. I had been collecting my material in boxes from day one of my career until today. I had a whole closet full of stuff. But I had no use for it. I was happy that the Smithsonian wanted the collection because I didn’t know what we were going to do with all of it. Now I have a new closet of space. The Smithsonian is going to put everything into order so it will make some sense. And if I want to see it I can just go over there and look at it. TT: The Smithsonian seems really pleased to have your collection because so much of the historical materials from Japanese Americans are in West Coast collections. Plus, you are a prominent gay Japanese American actor who has worked on stage and in film for more than five decades. SS: Sometimes I think “why me?” [Laughs] I still can’t believe that the Smithsonian wants my stuff. I really am very thankful for it. Tina Takemoto is an artist, writer, and associate professor of visual studies at California College of the Arts in San Francisco. She is board member of Queer Cultural Center and co-founder of Queer Conversations on Culture and the Arts.